"A Pokemon formed by 108 spirits which were bound to a fissure within an Odd Keystone as punishment for it's constant misdeeds over 500 years ago"
Ahh, Pokemon's answer for Legion; what a lovely fellow he is! Definitely one of the many out there that bring question to the constant statement that "there's no such thing as a bad Pokemon." 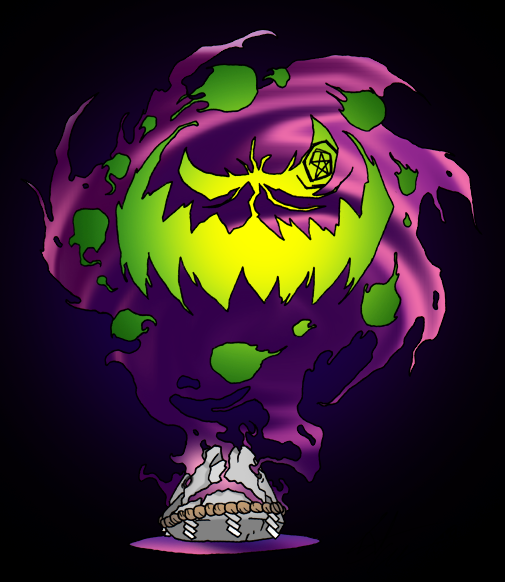 There's part of me that wants to like Spiritomb more and while it definitely isn't bad to me and it perfectly embodies both the typing of Ghost and Dark respectively it... I dunno, I've just never been able to REALLY like it? I dunno, I guess it just never felt like a Pokemon or a feasible creature. It feels more like a boss in an RPG or something, still cool mind you, but I dunno, it's just not one of my top favorites. Huh... I seem to be saying that a lot here, but I guess that is the point of placing these guys low on the list. I think why I can't get behind Spiritomb as much is because I don't have anything else to say about it other than that, like literally that's all I have to say. It's there and kind of terrifying and the thought of wielding this thing in a tiny ball to do your bidding is asinine at best... enjoy! I remember when idiots would hack Wonder Guard onto their Spiritombs (making it invincible.) and try to tell us it wasn't cheating because Odor Sleuth could still hit it. Interestingly, I believe the 108 spirits is a reference to The Water Margin if i'm not mistaken! Still, looks damn good.